International Journal of Research in Health Sciences,2017,5,3,59-63. 1Assistant Professor, Department of Pathology, Great Eastern Medical School and Hospital, Ragolu. 2Professor, Department of Pathology, GITAM Institute of Medical Sciences, Visakhapatnam, Andhra Pradesh, INDIA. 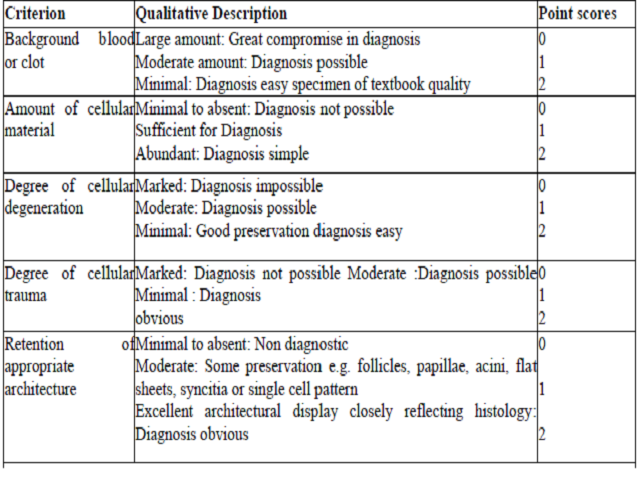 Introduction: Fine needle aspiration cytology (FNAC) is a easy and safe method. It has been used for the identification of superficial palpable lesions successfully. Deep-seated lesions have also been sampled by fine needle aspiration cytology with the imaging techniques with considerable success. FNAC is a straightforward, easy and reliable practice for the early diagnostic assessment of enlarged lymph nodes. The aim of the study conducted was to compare the two techniques- FNAC and FNNAC for diagnostic adequacy in superficial enlarged lymph nodes. Materials and Methods: The study was conducted in 50 patients with superficial enlarged lymph nodes using both the techniques- FNAC and FNNAC. Relevant history and clinical examination were taken. The two techniques were compared for the diagnostic adequacy based on five parameters using Mair et al scoring system. Results: In the present study, the cumulative score for FNNAC was more in comparison to that of FNAC (6.90 >6.60). For individual parameters, the average score for parameters like background blood (1.47 >1.44), degree of cellular degeneration (1.40 >1.30), trauma (1.40 >1.26) and retention of architecture (1.25 >1.16) were better in case of FNNAC in comparison to FNAC. However, average score for amount of cellular material was more (1.43 >1.39) in case of FNAC than FNNAC. All these differences observed among various parameters were, however, statistically nonsignificant with P-values of 0.416, 0.422, 0.319, 0.201, 0.160 and 0.1176. Conclusion: Both FNAC and FNNAC yield good material for diagnostic of evaluation of superficial enlarged lymph nodes. FNNAC provided superior quality smears for the interpretation and diagnosis of superficial enlarged lymph nodes. FNNAC is a good technique that needs to be utilised in the routine cytology practice for sampling of superficial enlarged lymph nodes.